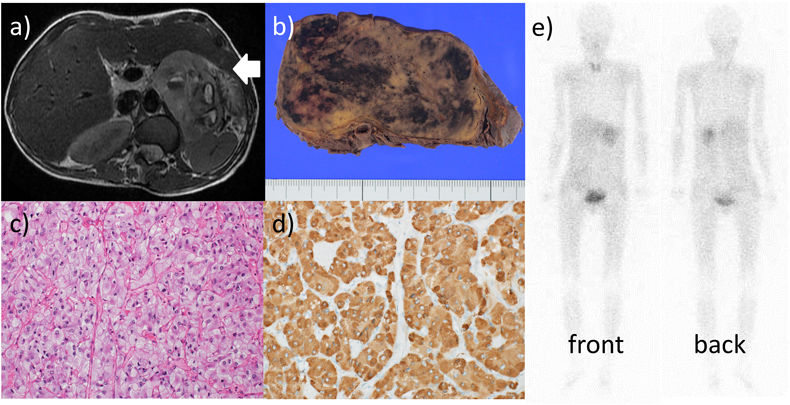 We report a rare case of a patient with pheochromocytoma (PCC) and Eisenmenger syndrome (ES). The patient was a female born to healthy parents. Although double outlet right ventricle (DORV) was diagnosed in the neonatal period, she displayed ES pathology from infancy. At the age of 30 years, PCC complications were diagnosed. An operation was contraindicated because of high perioperative risk. She died at the age of 32 years owing to advanced heart failure and renal failure. 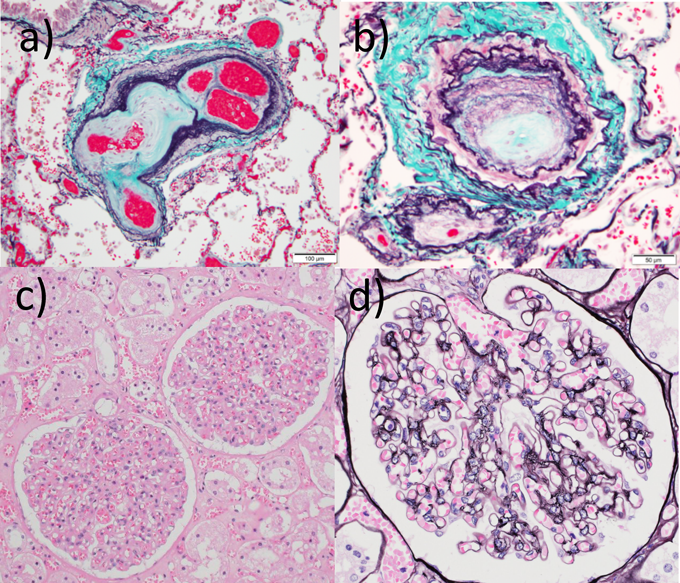 Her pathologic anatomy revealed DORV, severe pulmonary vascular obstruction, PCC in the left adrenal gland, multiple paraganglioma (PGL) in the bladder, and cyanotic nephropathy. In recent years, hypoxia has been reported as a risk factor for PCC/PGL. In our case, PCC/PGL was associated with DORV and ES. The diagnosis of PCC/PGL in congenital heart disease patients tends to be delayed as the symptoms of PCC/PGL overlap with those of heart disease. The harmful effects of hypertension and/or tachycardia on cardiac hemodynamics due to PCC were difficult to manage as she was contraindicated for surgery. PCC/PGL should be considered as a complication of congenital heart disease. a) MRI T2W1 reveals a left adrenal tumor with a diameter of 78 mm (white arrow). b) Gross feature of the abdominal tumor. The cut surface is brownish-yellow and associated with hemorrhage. c) Microscopic feature of the abdominal tumor. Nests of polygonal-shaped cells are demarcated by a rich vascular network. d) Tumor cells are immunohistochemically positive for chromogranin A. e) 123I-MIBG scintigraphy shows abnormal accumulation at left adrenal tumor. Thrombus (white arrow) is recognized from the trunk of the right pulmonary artery to the middle lobe branch. The right lung S5 area is collapsed. Thrombus persisted after her symptoms improved. 32歳時に感染を契機に心不全が悪化し，入院加療を行った．入院時の血液検査では，WBC 5570/µL, RBC 701×103/µL, Hb 13.8 g/dL, Ht 48.9％, Plt 245×103/µL, PT-INR 2.32，フィブリノーゲン456 mg/dL, FDP 3.5 µg/mL, D-dimer 0.2 µg/mL, BUN 45 mg/dL, CRE 1.50 mg/dL, Na 132 mmol/L, K 6.3 mmol/L, T-Bil 1.1 mg/dL, UA 8.8 mg/dL, CRP 5.7 mg/dL, BNP 624 pg/mLだった．炎症反応の上昇と，腎機能障害，BNPの上昇を認めた．尿定性検査では潜血，蛋白，糖いずれも陰性だった．胸部レントゲンは心胸郭比60％，肺動脈主幹部の拡大，両側肺門部周囲の腫脹と中枢肺血管陰影の増強を認めた（Fig. 3）．心電図は心拍数86/minの洞調律で，右軸偏位と完全右脚ブロックを認めた（Fig. 3）. Chest X-ray shows cardiothoracic ratio 60％, enlargement of the mail pulmonary artery, swelling around the bilateral hilar region and enhancement of central pulmonary vascular shadow. Electrocardiogram shows right axis deviation and complete right bundle branch block. 心臓は大動脈が前方，肺動脈が後方でいずれも右室から起始し，右室壁は24 mmと著明に肥厚していた．心室中隔欠損も認めたが，左室，僧帽弁は痕跡的だった．DORVに矛盾しない所見だった．心筋細胞の肥大も認めた．三尖弁と僧帽弁の陳旧性感染性心内膜炎と右肺動脈幹の陳旧性血栓，両肺野の著明な肺水腫とうっ血を認めた．腹部の腫瘍は11×7×4 cm，235 g，多辺形の細胞が胞巣状構造をとって豊富な血管網を伴いながら増生し，腫瘍細胞は免疫組織化学的にクロモグラニンが陽性でPCCの所見であった（Fig. 1b, c, d）．またミクロ所見で膀胱および傍大動脈領域に多発性PGLを認めた（Fig. 4a, b）. a) Microscopic feature of a paraganglioma around abdominal aorta. Polygonal-shaped cells proliferate along the sympathetic trunk (asterisk). b) Multiple microscopic foci of paraganglioma in the urinary bladder (arrows). Inset, immunohistochemistry positive for chromogranin A.
Succinate dehydrogenase subunit B（SDHB）免疫染色で腫瘍細胞の染色性は保たれ，SDH変異は否定された．肺血管は内膜病変が高度に進行し，Heath–Edwards分類4度，Index of Pulmonary Vascular Disease: 2.8と高度の肺血管閉塞性病変を呈していた（Fig. 5a, b）．腎臓はうっ血を伴う糸球体腫大，メサンギウム細胞の軽度増殖とメサンギウム基質の増加を認め，チアノーゼ腎症の所見を呈していた（Fig. 5c, d）. a), b) Pulmonary vascular lesions are end-stage (H&E: grade IV, IPVD: 2.8). a) Histological examination of the pulmonary vessels. The intimal lesion is highly progressed, with the formation of a plexiform lesion. b) The nodule is completely occluded due to fibrous thickening of the intima. c), d) Cyanotic nephropathy. Glomerular enlargement is seen, with increased mesangial matrix and cellularity. H&E: Heath–Edwards classification, IPVD: Index of Pulmonary Vascular Disease.